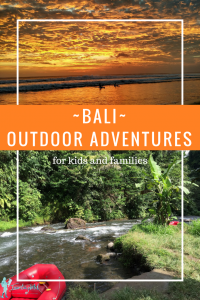 This guest post from Kate at Rolling Along with Kids has us anxious to plan some outdoor adventure in Bali. I think it will do the same for you! Check out her bio below. 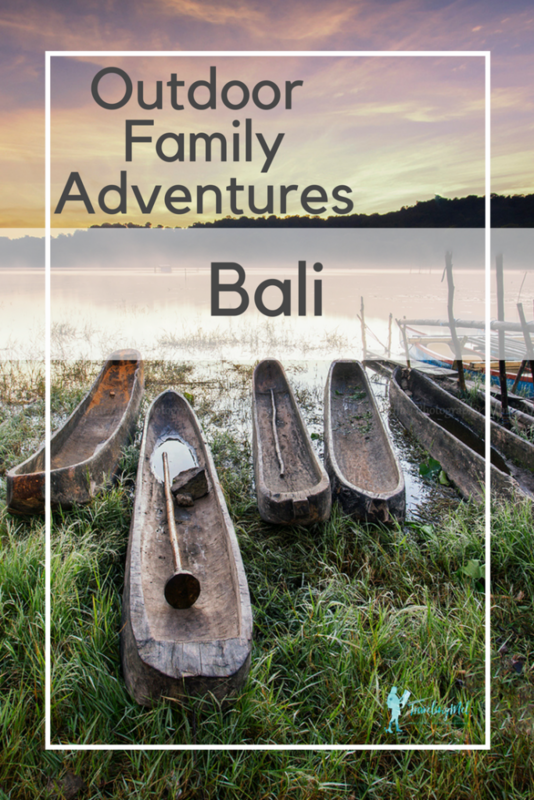 Traveling to Bali with the family is full of fun and adventure. There are so many things to do in Bali with kids and here is our list of the top five outdoor adventures to keep the whole family entertained. Remember to take sunscreen, hats, and plenty of water as Bali can get hot! 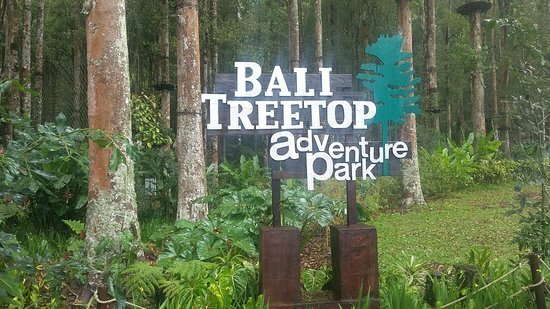 Located in Bedugul, Bali Treetops is approximately 1.5 hrs drive from Kuta. The park has a high ropes course set up in the trees of a national park and kids from the age of four years can have a go. There are different circuits to try, starting with the Squirrel Yellow Circuit (from ages four years and that can reach to 110cm minimum) and goes right up to the heart stopping Adrenaline Black Circuit (over 12 years old). This is something for the whole family as Mum and Dad can have a go to! Here’s what you need to know about what to pack for Bali. See our adventure park fun in Florence, Italy, Aberfoyle, Scotland, and Tyrol, Austria. For the ultimate day out in Bali for kids, you cannot go past the waterslides at Waterbom waterpark in Kuta. It is no mistake that Waterbom is rated as the best waterpark in Asia; there is something for every age! 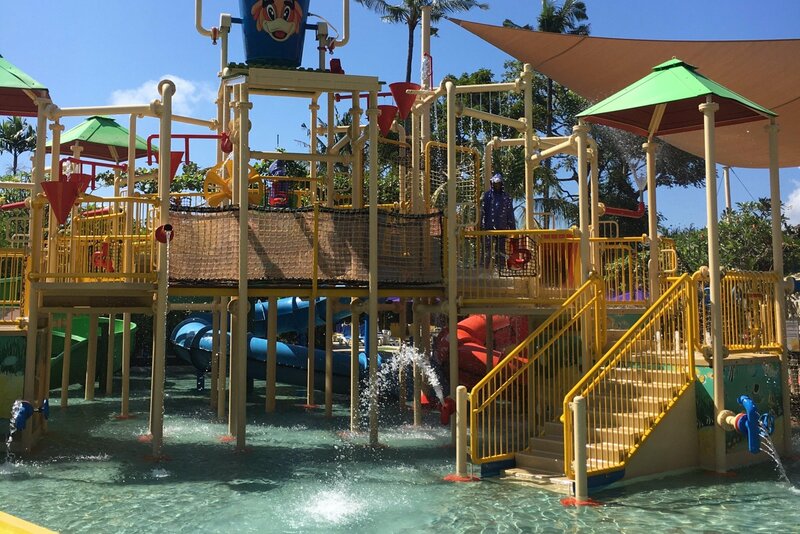 The funtastic kids’ area is excellent for young kids under the age of four with slides, paddling area, and lots of fun squirting the water guns. The lazy river is one for the family to enjoy together as you float around taking in the sites of the waterpark. The waterslides throughout the park are great for all levels including extreme rides to suit even the biggest daredevils. Hiring a gazebo is a great way to have a central spot for the family to enjoy and the massage tables are not far away for the not so brave. 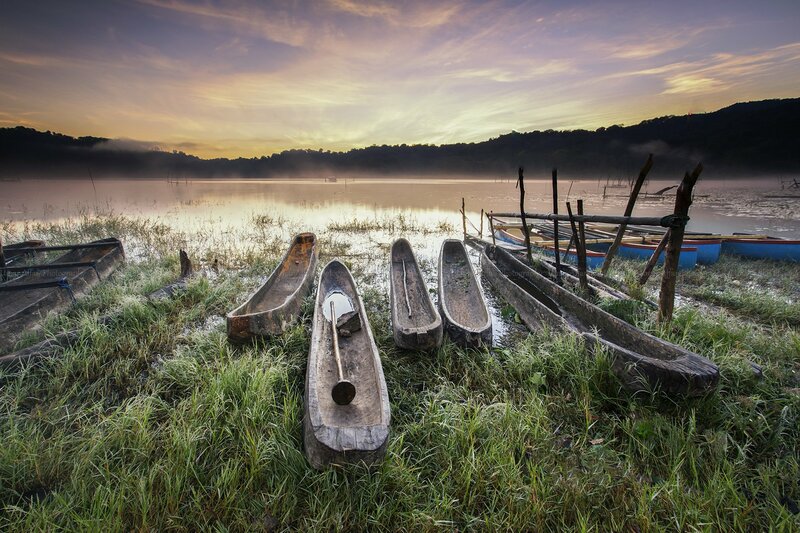 Find more hidden gems in Bali. 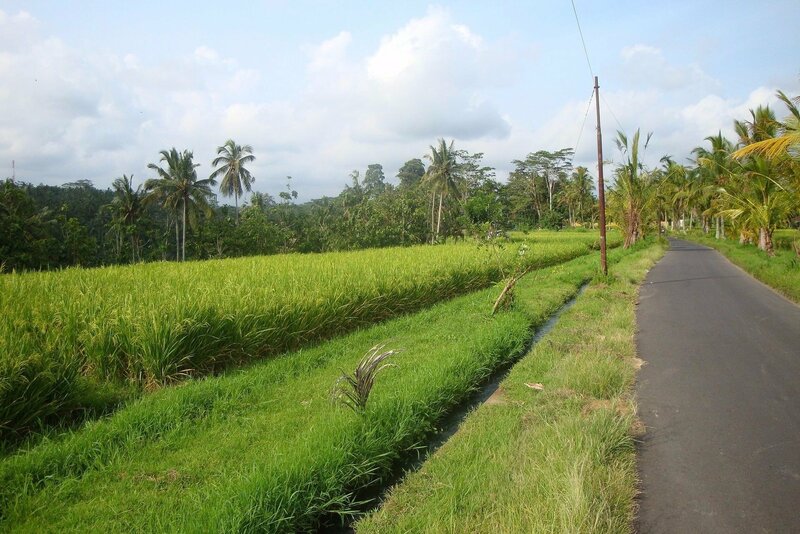 Riding through the villages of Bali is such a great way to explore Bali with kids. Most of the bike tours leave from the Ubud area as the streets and roads are easier to ride on than the tourist areas of southern Bali. Many of the companies, including Bali Bike Baik and Bali Eco Cycling, have bikes with toddler seats so the whole family can join in. Kids’ bikes can also be provided and the Balinese are so helpful and accommodating that if they are a bit slower, it’s “no problem”! They are so welcoming of all abilities and what better way to experience the Bali culture. Read about biking in England and Scotland. 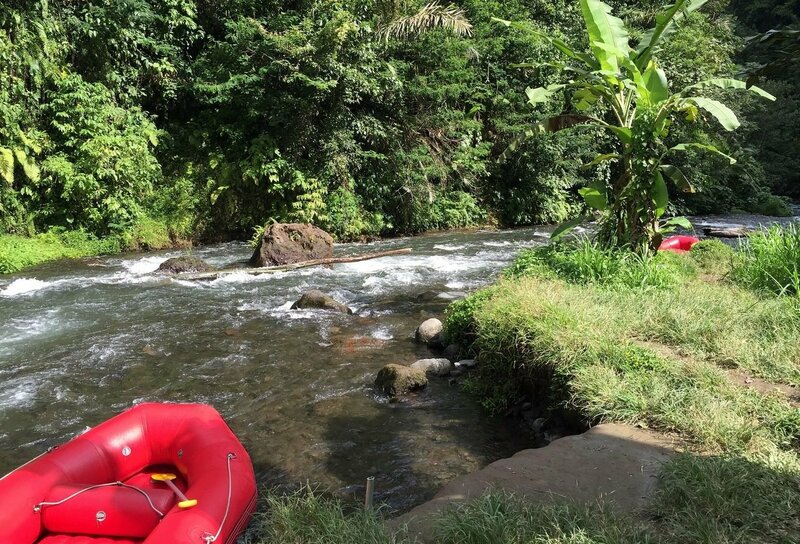 There are two main rivers in Bali to go white water rafting, The Ayung River and The Telaga Waja River. Ayung is more suited to beginners and with kids but it does have quite a few stairs at the start and end of the raft. Some companies including Bali Adventure Rafting Tours and Bali Sobek Rafting take kids from the age of five years so it is best to check with the rafting company if you have kids around that age. Safety is paramount with lifejackets and helmets supplied. See our whitewater rafting adventure in the Tara River in Bosnia and Montenegro. Bali is well known for its surf and what better place to learn to do it. 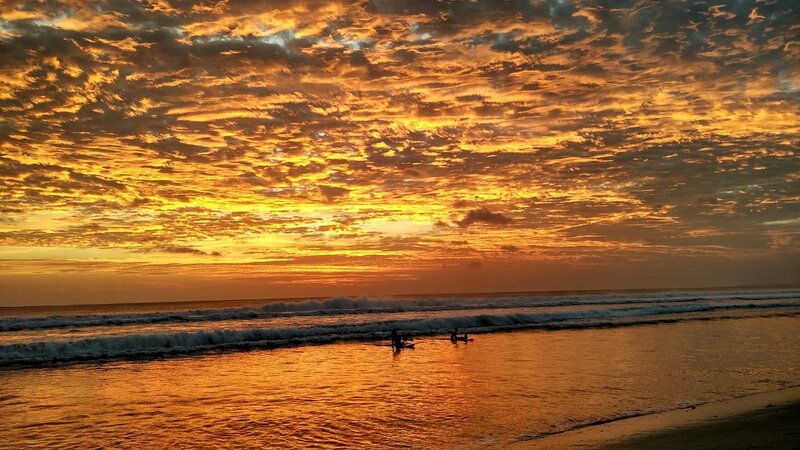 The best place to try surfing on the island with kids is Kuta/Legian. There are multiple surf schools along the stretch of beach including Odysseys Surf School and UP2U Surf School. Learning to surf is usually recommended for kids over five years but check with the surf schools as they often have private lessons or family lessons where you can all join in. If that’s not enough, here are even more fun things to do in Bali. There are many more fun activities to do in Bali with kids. The best tip that I will share is to plan your day as the traffic in Bali can get very congested and short distances on maps become a very long drive especially with kids. If you were keen to try out the Bali Treetop Park, bike riding, and white water rafting, I would recommend staying in Ubud to enjoy all of these adventures without the constant need to be in a car. Waterbom and learning to surf can be enjoyed from any of the southern tourist areas including Kuta, Legian, Seminyak, Jimbaran and Nusa Dua. If it is your first time in Bali, make sure you check out these tips on where to go, what to eat, and how much to tip. Enjoy your time in Bali. The people, the culture and the food will ensure that you want to return. Kate is the Australian mum behind Rolling Along With Kids, a blog focused on travel to Bali with kids where she hopes to inspire families to explore more of the beautiful island. Check out her Ultimate Guide to Bali for Kids and say hi on Facebook and Instagram. Need more ideas? Here are 101 Things to do in Bali.